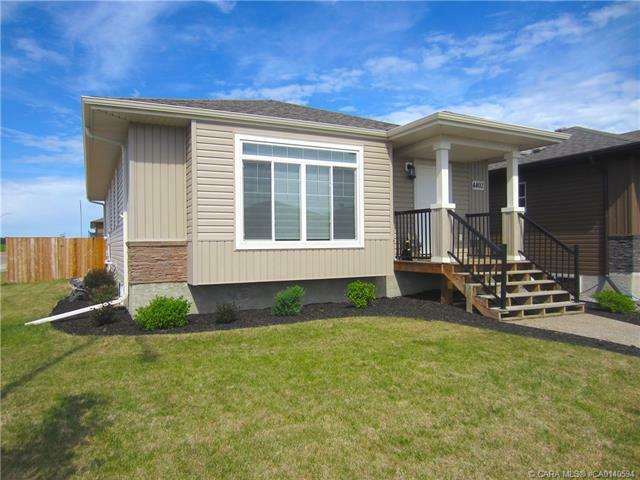 Have a look at this stylish 4 bedroom Bungalow. Over 1200sqft on the main floor fully finished with vaulted ceilings, main floor laundry, upgraded window coverings, HW on Demand and located on a convenient corner lot providing privacy and extra parking. Upon entering this home you'll know it's a step above with tasteful finishes and totally move-in ready. Bright and open concept living arrangement with expandable living/dining spaces and a wonderful kitchen layout featuring stainless appliances, eating bar and corner pantry. Off the kitchen is a handy designated laundry room with folding counter and down the hall a cozy bedroom and 4pc main bath. Rounding out the main is a beautiful Master Bedroom with walk-in closet and 5pc ensuite. Fully finished basement allows for 2 spacious additional bedrooms, another 4pc bath, good storage options and a wide open family room layout. Heading outside you'll enjoy an 11x12 raised deck, fully fenced yard and 2 car parking option. You'll love it!